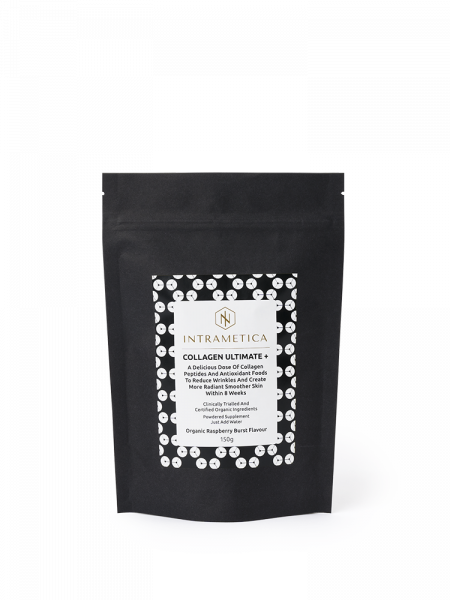 Collagen Ultimate + 150g powder in beautiful miron glass preserving caddie to preserve and protect the formula. 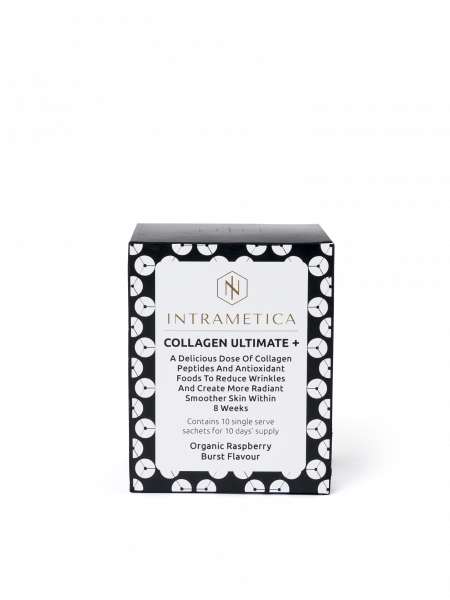 Intrametica® Collagen Ultimate+ not only acts on a single parameter, but has a full and complementary action on all factors involved in skin radiance. It visibly reduces uneven pigmentation and skin tone after 4 weeks, helps protect against sunburn and decreases premature ageing effects of sun damage, increases skin moisture and hydration and assists with collagen production, skin regeneration and renewal. 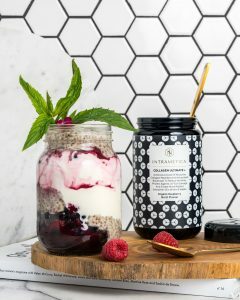 Dissolve two rounded teaspoons (5 grams) a day with 200ml of water or juice, sprinkle over food or add to your favourite smoothie. When we expose something to light, it reacts — it allows living plants to grow, it causes dead plants to wither. Clear (and some other types of glass) allow light in the visible spectrum to penetrate through, causing products to degrade more quickly and encouraging microbial growth. Miron violet glass is different: it filters out light in the visible spectrum, letting in only UV light (UVA and UVB) and infrared. The absence of visible light helps the product resist degradation, increasing the product’s shelf life. While violet glass filters out visible light, it selectively lets in UVA and UVB rays, which actually suppresses negative microbial growth. We use Miron glass in our caddies because it allows us to avoid preservatives and antimicrobial agents unlike many products on the market, ensuring your product maintains freshness and is chemical free. This product contains trace amounts of soy (from lecithin). This product contains FISH derivatives. Use caution with known allergies to this form of protein. Not suitable for children under 15 years unless specifically prescribed by a qualified healthcare practitioner. Consult your healthcare professional before using if you have any concerns.